In this Tennessee Williams classic about a southern family in crisis, wealthy Mississippi plantation owner Big Daddy Pollitt celebrates his sixty-fifth birthday with his family. As Big Daddy tries to deal with the strained and childless marriage of his favored son Brick and his disappointing other son, Gooper, Brick's beautiful and desirable wife Maggie tries to coax her husband away from the bottle. This is a play with mature themes and language. Consider it a PG13 production. Lionheart Theatre Company's "Cat on a Hot Tin Roof" offers a number of delights, particularly Sarah Frey in the pivotal role of Maggie. This is a Maggie who delights the eye with her svelte good looks and charms the ear with her purr. The first portion of the show is basically a monologue for Maggie, and Ms. Frey keeps the energy moving as she prowls from spot to spot. The somewhat age-blind, color-blind casting of the show throws things off kilter a bit, and the rest of the show doesn't live up to the promise of Maggie's opening scene. 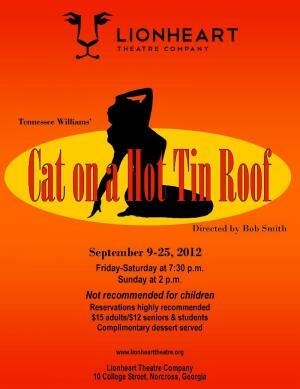 This is a "Cat on a Hot Tin Roof" that doesn't delve below the surface the way it could. Lionheart's performance space is intimate, and much could have been done with subtle glances and movements. Here, though, we get uninventive blocking and Allen Stone's obvious glances and comments as Gooper. That would be fine, if something more subtle were going on from time to time, but the broadness plays in a vacuum, making it seem artificial. Ben Humphrey, as Brick, also seems to have been let down by the director. Brick is a taciturn character, so his performance has to be largely non-verbal. Much is made of Brick's good looks, but Mr. Humphrey's balding pate makes him appear older and blander than he should. It's the director's job to make everyone look good, but the Brick we see is not a former football star. There is nothing in Ben Humphrey's performance or build that would prevent him from seeming one. It's just the lack of hair and lack of subtle depth that impair his performance. Bridget Shepard, as Gooper's wife Mae, gives a nice performance, but doesn't seem to be the stated eight years older than Maggie. Gooper, the older son of Big Daddy and Big Mama, appears to be of an age with his parents. The age disparities harm a show in which only the surface of Tennessee William's script is showing. Children and servants give a bit of the feel of an over-crowded household, and the Reverend Tooker and Doctor Baugh also flesh out the environment a little without making much impression. The set by Katy Clarke is one of the more interesting aspects of the show. Walls are black and unadorned, with two exceptions: a slight hint of red rises behind the bed center left and gold filigree surrounds the bar stage left. The bar is Brick's "Echo Spring" paradise of alcoholic numbness, and the set points that out brilliantly. Lighting is disappointing, however, with some effects that just plain don't work (bathing Big Daddy in red during a speech while Big Mama is in white light; flashing a venetian blind shadow on the back wall at act end). The set has a big opening center stage, but no doors. Director Bob Smith has chosen to mime the opening and closing of doors in this opening. A large part of the premise of the show is that Brick and Maggie aren't private even in their own bedroom, and the physical lack of doors underscores that. The physical door on the bathroom isn't consistent, but doesn't detract. I heard positive feedback from other audience members about the mimed doors. A veranda around the house is suggested by a balustrade painted on the upstage wall outside the opening and by some entrances down the side of the audience and around to the back of the stage. The effect is diminished, however, when a servant steps in front of the stage at one point to sing. A painted sky effect on the upstage wall, above the height of the room's flats, is somewhat lost by the lighting. Before the show, I had seen a lighting device pointing high, and anticipated that it would be used for a fireworks effect. Instead, it was used for the venetian blind effect. Bear in mind, this is a small, curtain-less community theater with limited seating. So watching a classic Tennessee Williams production in such a venue requires you to adjust your expectations accordingly and prepare to witness an unintentional comedy � or so I thought. The opening can mislead the audience into a sinking notion this production is nothing more than regurgitated script when Maggie�s (Sarah Frey) incessant dialogue has you wondering if the woman ever inhales as Brick (Ben Humphrey) shuffles between his marks waiting for his cues with an unassuming blank stare. However, if you can endure the opening sequence, you�re in for a real treat. The quality of the production takes an unexpected turn once Big Mama (Tanya Caldwell) and Big Daddy (Rial Ellsworth) take the stage. Their energetic stage presence revives the production and suddenly the cast comes alive, the sparse set becomes irrelevant, and the audience is drawn into the family crisis so masterfully crafted by Tennessee. Akin to finding priceless art at a garage sale, this production will surprise you. See this play. Take this opportunity to catch small town acting worthy of a far bigger stage (and your date will marvel at your ability to find entertainment in the most unusual places).